That awkward moment when you realise you’ve just walked three miles along a busy road with your poms poms out! 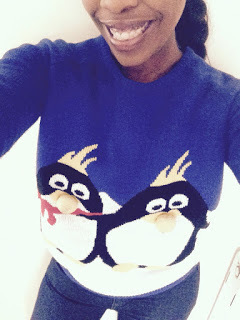 When I wore this Christmas jumper last year, I was 3 months pregnant and trying not to vomit every hour of the day, so I hadn’t noticed the not so subtle placement of my penguin pom poms. It’s clear now that I was more ill than I realised, because I can usually find the silly innuendo in most things! But, hey, it’s all good Christmassy fun and is (with my donation), in support of Text Santa. The annual UK Text Santa campaign moves us along from writing letters to Santa, to encouraging people to send a text message, which converts to a donation, that ultimately grants a Christmas wish for people in need. So, Santa does exist and, for one day only, he takes the form of Philip Schofield who is the silver haired, foxy ambassador of the campaign. Save the Children – even closer to my heart, now I’m a mother. They work in over 120 countries, including the UK to provide education, disaster relief, child protection, health care and more. We are Macmillan – Cancer Support – the last few years brought cancer to the doors of my friends and family and Macmillan nurses played a large part in providing support and care to everyone, particularly during those last months. And, Make a wish, UK, which ‘grants magical wishes to enrich the lives of children and young people fighting life-threatening conditions’. These can be anything from granting the wish to become a zookeeper for a day, to providing a specialist computer to support communication for a severely disabled young girl. 100% of the text donations go to the charities and if you want to see what they do with it, click the links below. From a personal point of view, I have seen people close to me benefit from the charitable donations and the dedicated people on the ground (voluntary or otherwise) that make these charities work in the special way they do. Even if people don’t want to donate financially, the way I see it is if these kinds of campaigns can inspire and mobilise and bring awareness of these, or other worthy causes, surely that’s a good thing. And if people decide to help in their own ways – volunteering, campaigning, then that really does grant a lot of wishes. I’ll also be counting my blessings that all my own wishes of health and happiness this year, have been granted. Make a Wish – UK – what they do, how to get involved and where the money goes. Nice post. You're right about the volunteering aspect. That matters too!